Whilst your author is aware that the 'Vintage Furniture Flea' being held today at York Hall in Bethnal Green is, in fact, a jumble sale for second hand furniture, there is nothing wrong with that, and the sale offers an extra bonus of entrance to the atmospheric hall, opened in 1929, and venue for countless boxing bouts and East End weddings. 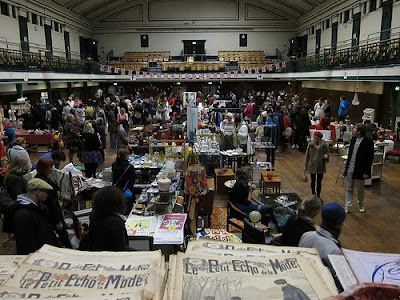 We are told to expect atomic-prints, ornaments, cushions, crockery and glass, as well as other furniture and homewares from up to forty vintage traders celebrating the kitsch & the collectible. It all sounds like a pleasant way to while away an hour and entrance is only £2. The website says it's taking place tomorrow!